As an Instructor, you can enable Statistics Tracking for an individual content item such as a File item containing your lecture slides or a Web Link that directs students to an external resource. Turning on Statistics Tracking allows you to generate a report to see which students have accessed that content item, and how often that content item is accessed throughout the day and week. Unfortunately, the data on the report is inaccurate. This is because the report generates statistics based on when the Content Area that houses the content items are accessed – not when the content item is accessed. So if a content area has multiple content items with Statistics Tracking enabled, any report created from any one of the different content items will contain the exact same data. 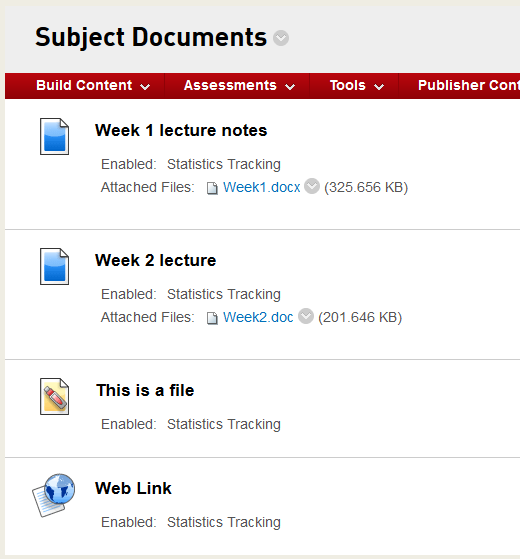 If you look at the below screenshot, you can see that each content item in the “Subject Documents” content area has Statistics Tracking enabled. If you generate a report for each content item, each content item report will contain the exact same data as the data is based on when the “Subject Documents” content area was accessed, not when each content item was accessed. The UTSOnline vendor has confirmed that this is functioning as designed although acknowledge that the design is not intuitive. It works on the principle that if the content item is displayed, then it counts as accessing it. A request for enhancement has been submitted to the UTSOnline vendor. No workaround. You can create a solitary content item in a content area if you would like to improve the accuracy of the data on the report for that content item but you cannot capture data to identify if a student actively viewed that content item.